Guy Russell, John Walsh, Jon Lay, Harry Vincenzi and Chuck Andersson. We were playing the East and South nines today at the Royal Thai navy course, with a cut of 10-17and 18+ in the two divisions. The greens were very slow, which is unusual for this course. 40 points was the best score of the day, coming from Pete Sumner to win division 1 ahead of Dennis Scougall in second on 38 and Bob Comartin third with 34. Alan Bissell was the winner in division 2 with 33 points, Jim Connelly, now back on the white tees, was second one point behind and with a 17/13 back-nine countback John Carlin took third over Bill Kana, both with 31 points overall. Near pins went to (Div 1) Bob Comartin, Dennis Lea and Pete Sumner and (Div 2) Alan Bissell, Bill Kana and Jerry McCarthy. There were no ‘2’s in either division so rollovers to Crystal Bay on Wednesday. Still no when the A course will actually reopen, so it was B and C nines off the white tees today with the cut at 6-17 in the top tier. With 21 points on the front nine Pete Sumner coasted in with 39 overall to win division 1, one ahead of Bob Comartin in second on 38 and Paul Butler finished third with 37. In division 2 the newly arrived Bruce Gardner won with 41 points, with John Carlin second after beating William Chang on a 20/16 back-nine countback, both with 37 points. Near pins were claimed by (Div 1) Ron Miller (2) and Pete Sumner (2), and (Div 2) Paul Butler, Ray Daws and Louis Wong. 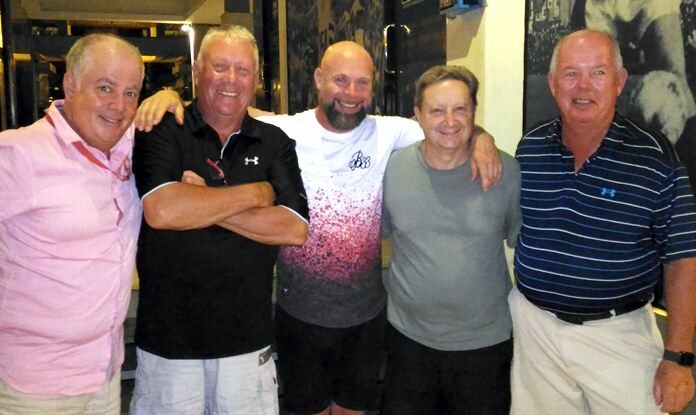 Ron Miller birdied C7 in division 1 while there were four ‘2’s in division 2, from Shane Tutton on B3 and Ray Daws, Bruce Gardner and Guy Russell on B6. We had nine groups out today and with more than 32 golfers there were three divisions with the cut set at 8-16.9, 17.1-21 and 22+. The greens here are still very slick and today there were some tough pin placements. After recently having his handicap cut Ron Lavette recorded the highest score of the day, winning division 3 with 39 points. Johnny Walsh was second with 35 points, Glyn Evans third on 32 and Guy Russell fourth one point further behind. Chuck Andersson topped the podium in division 1 with 38 points while Harry Vincenzi beat Pete Sumner on a 17/14 countback for second after they both scored 34 overall. Jon Lay completed the podium in fourth with 33 points. The division 2 winner was Bill Kana with 35 points, with Gerry Cooke second three points behind and there were three 31 scores fighting for third and fourth places. A 18/13/12 countback saw Colin Aspinall in third, Frank Kelly fourth and John Carlin losing out. Near pins went to (Div 1) Bob Comartin and Jon Lay (3), and (Div 2) Gerry Cooke, Steve Harris, Frank Kelly and Harry Vincenzi. Harry Vincenzi birdied the 17th in division 2 and in division 1 Chuck Andersson also got a ‘2’ on the 17th while Bob Comartin birdied the 13th and Jon Lay the 6th and 17th.